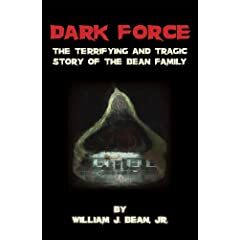 I recently read Bill Bean’s first book Dark Force. To say the least it is a disturbing book. It chronicles his childhood between 1970 and 1980, from age four to fourteen. For most people this is a period of your life that you have fond memories of, for Bill it is a period that that represents pure unadulterated evil. Bill and his family moved into a typical middle class three bedroom house in Glen Burnie, Maryland. A house like so many others in the neighborhood. Yet this one was not like every other. This one held a very dark secret. The Bean family were not the only occupants. Shortly after moving in strange things started to happen. Late at night they heard tapping noises on the walls, footsteps in the attic, and various other unsettling events. This was merely the beginning. As time went on the problem escalated. This was no prankster poltergeist, it was a dark force bent on causing death. You might not buy into the paranormal, many people do not. But I will say this, Bill Bean has written a very chilling book, even exorcising the paranormal aspect you are still left with a very disturbing story. I had the chance to sit down with Bill and talk about his childhood experiences. It is one thing reading a book, it is entirely another thing to get the story told to you first hand. Clearly the decade of the 70’s has left a very big scar on Bill and the remaining family members. You can listen to the whole interview here. You can order your copy of Dark Force from Amazon. Bill Bean also has a web site with additional information. No user commented in " An Interview With Author Bill Bean About Dark Force "